​​Last month I was at a panel session for the Institute for Sustainable Solutions launch of the Students Fellow Program, a student at the event asked a question regarding whether his work at a Head Start program (a program that helps young prepare for 1st grade) was related to sustainability, I didn’t get to answer his question but I wrote this. I asked students "How many of you are serious about tackling climate change?" The City of Portland, Oregon, is a unique area of the United States. The census in 2010 found it to be over 70% white in population. The Coalition of Communities of Color, a group advocating for the wealth, interests, and needs of people of color living in Oregon recently released a report on the status of the communities. It outlined that today nearly one in every two kids in Multnomah County, home to the City of Portland, is a person of color. Tides are quickly changing in the city, and consequently the same is taking place with college students. The City of Portland and Portland State University (PSU) have such a symbiotic relationship, that it is vital to understand the city before you dive into PSU. My experience at PSU, given the context provided above, was in many ways alienating and in others home-like. When meeting with students, a concern that often seems to be brought up is the alignment of their current work with their interest towards sustainability. This is why I am going to narrowed down 3 tips for all students who are considering or attend PSU, and coming out on top. Given that you and I share the mutual interest in sustainability or the environmental field, then you got a role to play, no matter your ethnicity, race, or orientation. Familiarize yourself with your roots, and learn about others. 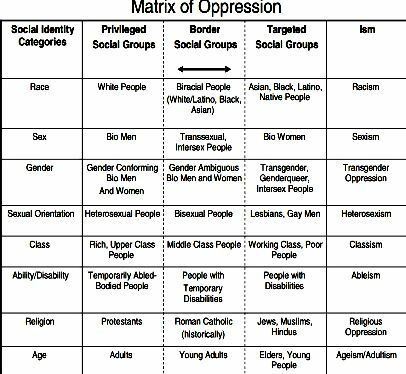 At some point, you will identify how you and your family have been privileged, and at some point, you are going to identify when you were oppressed. It is important that you come to realize where you stand so that you know how to direct the time, work and resources to addressing the injustices we live in now… climate change, gang violence, lack of food or shelter. If you self-identify to be part of a dominant group, then step back and listen. If you self-identify to be part of a group who has been/is oppressed or marginalized, it is your turn to step in and share your ideas. Yes, those ideas are important, and no you don’t need a college degree to participate. Your comfort zone, for those science nerds, is your day-to-day habitat and niche. It is where you spend most of your time, who you know best, what hobbies you take part of, the behavior you have. In order to get out of this zone, you need S.M.A.R.T. goals to quantify your progress in expanding it into the ‘risk zone’ or where you don’t feel comfort. We are in need of green jobs, yes there are alternatives to oil, gas & coal, but no they are not perfect technologies. We need innovation to create sustainable solutions. Those are most likely to come from an environmental workforce, a diverse one. Literature tells us that diverse teams perform the best, in order to overcome the barriers ahead of us, we need to perform at a prime form. This means we diversify our environmental workforce, and ultimately follow and support the new ideas that are brought in by diverse communities. For a student that may be part of one or many dominant groups come to understand that there is a difference between being racist, and not preparing for exclusive outcomes. Equity should be one of the first things you familiarize yourself with. The environmental field has historically, and still is most dominantly white. To put it simply, we must equitably build wealth. If you belong to a minority group, such as a person of color, I encourage you to be persistent. I remember feeling like my experience as an immigrant was not valuable, but you matter and will have a say on your future. Every one other kid in the city is a person of color, we are the future. This means you engage, learn, and lead. Once you got somewhat of a handle on who you are, where your ‘risk zone’ is, the next logical step for me is for you to collaborate. There are plenty of opportunities in the City of Portland to engage in the environmental field, and chances are they can find a way to include you in some work. Volunteer, intern, build your network and take initiative to propose funding for a position. This gets back to my previous point; those who have not been included in the conversation must be included. Literature tells us that a resilient project is one with good community structure. In order to get there, we need to collaborate, take initiative to find out how others work, their leadership styles. Knowing how your teammate's work allows you to have better communication, and ultimately better performance. If you belong to a dominant group, don’t seek to start a complete own idea. When working with people of color, for example, seek the user experience rather than the design experience you wish them to take. Analyze the barriers that don’t allow people of color to participate in your programs, and allocate time, work, and resources into meeting them at their table. To end - I will answer the question that the student posed at the launch event, he asked if his work with kids at a Head Star program is something aligned with his sustainability aspirations. My answer to you - yes they are connected! Thank you for sharing, this is a very clear and thoughtful point. It is also very empowering for people of color, we need to be more involved. I like how you asked for people to shared their ideas because they all matter.